Preheat oven to 200°C/400°F and line a baking sheet with parchment paper, if needed. Peel carrots and roughy dice. Add to a large mixing bowl along with garlic, olive oil, and cumin and stir to coat. Add carrot mixture to the prepared baking sheet, transfer to oven, and roast for approx. 20 min. at 200°C/400°F until carrots are tender. Drain chickpeas and reserve the liquid. Transfer carrot mixture, chickpeas, lemon juice, lemon zest, and paprika powder to a food processor and blend until creamy. Add reserved liquid from chickpeas, a little at a time while blending, until smooth and silky in texture. Season with salt and pepper to taste. 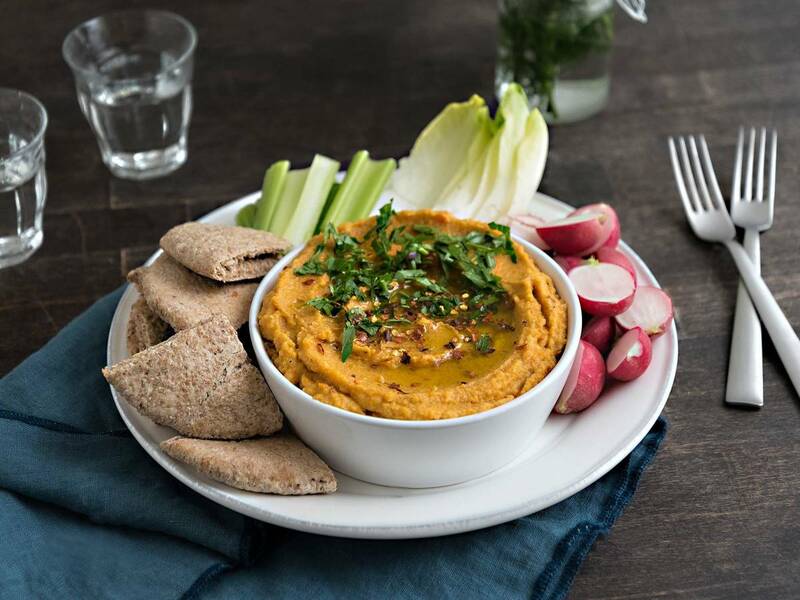 Transfer hummus to a serving bowl, drizzle with olive oil, and sprinkle with paprika powder and Ras el Hanout to taste. Cut pita bread into triangles and toast. Serve alongside hummus and enjoy!